SappiNorthAmericaDrivesSustainabilityandGrowthwithNaturalGas - Summit Utilities Inc.
Somerset Mill in Skowhegan will save more than 30 percent on annual energy costs. SKOWHEGAN, Maine – Sappi North America’s Somerset Mill in Skowhegan is now running on natural gas and the paper mill is already seeing economic and environmental benefits. Recently, Summit Natural Gas of Maine completed the final installation of equipment to allow the Somerset Mill to run using natural gas at full capacity. Representatives from the Somerset Mill project a savings of more than 30 percent by switching to natural gas, in addition to the environmental benefits that include cleaner air and fewer emissions. Sappi North America’s Somerset Mill in Skowhegan, Maine is now running on natural gas and the paper mill is already seeing economic and environmental benefits. Recently, Summit Natural Gas of Maine completed the final installation of equipment to allow the Somerset Mill to run using natural gas at full capacity. Representatives from the Somerset Mill project a savings of more than 30 percent by switching to natural gas, in addition to the environmental benefits that include cleaner air and fewer emissions. In the last decade, the paper industry in Maine has experienced higher energy costs and foreign competition resulting in mill closures around the state. Sappi North America’s Mill in Skowhegan is the seventh-largest coated paper mill in the world producing more than 2,400 tons of paper per day. The mill also employs more than 700 Maine workers. 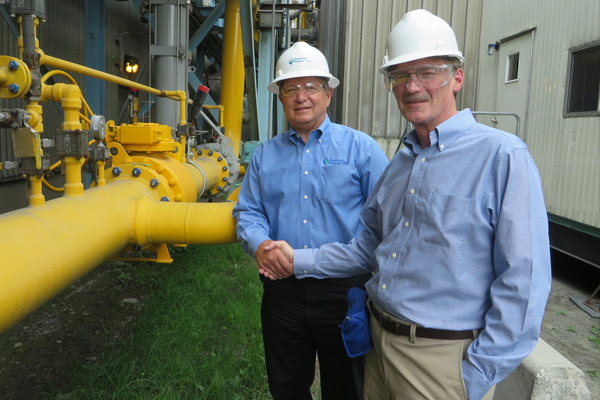 Since 2013, Summit has provided natural gas service to residents and businesses in the state as a new lower-cost energy source and valuable option for Maine’s largest industrial companies, from paper mills to hospitals. “With natural gas, the mill will have an additional energy resource available in their portfolio providing an additional opportunity to save on their energy costs. We’re proud to provide an energy source that will help keep the Somerset Mill in a cost competitive position,” said Mike Minkos, president of Summit Natural Gas of Maine. The Somerset Mill currently uses #6 fuel oil and already has plans for how to use the savings from switching to natural gas. “Initially, we plan to pay for the $24 million project investment that will reduce our cost of manufacturing to remain competitive to other mills who have benefited from natural gas access. The reduced manufacturing cost will improve earnings for further reinvestment and improvements to our processes,” said Gardner. Natural gas will replace #6 fuel oil used in the lime kiln, savings equivalent to 80,000 to 100,000 barrels of oil per year. Converting to natural gas will also reduce oil use in the power boiler and decrease the ash load on the environmental equipment. In addition to serving Sappi North America, Summit Natural Gas of Maine has installed more than 130 miles of pipeline in the Kennebec Valley area as well as Cumberland, Falmouth and Yarmouth in southern Maine. In 2014, Summit Natural Gas of Maine has plans to install more than 100 miles of natural gas pipelines to service areas in Maine, more than any other gas company.